The following are remarks from SBAI faculty associate Jennifer Kyker, Assistant Professor of Music at University of Rochester and Assistant Professor of Musicology at the Eastman School of Music, upon receiving an alumna award from Mount Holyoke. Professor Kyker’s comments were so inspirational that we wanted to share them here. They are a must read for any individual who is committed to social justice, activism, and the big problems of the world (and for those who are committed so solving them through research, teaching, and direct grass roots action). Besides her work teaching at the University, Professor Kyker is deeply involved in HIV/AIDS research and activism and founded the nonprofit organization Tariro, which works to educate and empower teenaged girls in Zimbabwean communities affected by HIV/AIDS (www.tariro.org). In recognition of her work on HIV/AIDS, she has been honored with several fellowships and awards, including a Leboy-Davies Fellowship in Women’s Studies from the University of Pennsylvania, as well as an alumnae fellowship from Mount Holyoke College. I am deeply honored to receive the Mary Lyon Award, and I want to thank the Alumnae Association for recognizing me in this way. In the few minutes I have with you today, I want to talk not only about what I do, but also why I do it. As an ethnomusicologist, I have a job that is in many ways very wonderful. Playing music is something people do because it makes them happy, expresses something about their identity, or connects them to their community. 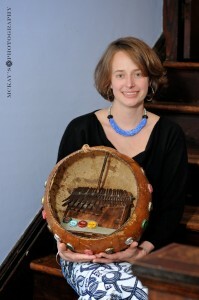 I, too, love playing music, particularly the Zimbabwean mbira. And I also love sharing Zimbabwean music with the world through my writing and teaching. But ethnomusicology can also be very hard, because I see people’s pain, their suffering, and their struggles in addition to the joy they feel playing music. In the Zimbabwean context, this suffering has been especially apparent to me as the AIDS epidemic has unfolded. Since I first traveled to Zimbabwe in 1995, almost half of the musicians I have studied and performed with have died, almost all of them from complications of AIDS. My first host family was especially affected, and they are all gone, really, leaving only several young, orphaned grandchildren. Reflecting back on my experiences, I see that the questions I’ve spent much of my time trying to answer since graduating from Mount Holyoke are in some ways very particular, but in other ways, they are deeply universal, and questions that we may all be especially attuned to right now. How do we respond to suffering in a meaningful way? What do we do when the magnitude of people’s struggle seems to great to comprehend? And where do we turn, when we realize that maybe we shall not overcome, win the fight, solve the problem, or see peace and social justice in our lifetimes? I don’t have the answers for you. But I think that sitting with the questions is important, just sitting with them, in order to make peace with them, and with ourselves. So this is the first thing I would encourage you to do. What comes next? I believe that our lives derive beauty from the productive tension between our dreams and our acts. So I would tell you, the next step is to dream big – dream the biggest dream you can – and to act small. That one, small act, if it is intentional, authentic, thoughtful and passionate, holds within it the kernel of your dream. Small acts are the seeds from which big dreams germinate and grow. So if you dream of women’s equality, sponsor a single girl to go to school. If you dream of a sustainable economy, buy a bicycle instead of a car. And if you dream of a world without AIDS, join a vaccine trial. Each small act will inspire you not only to see the possibility of taking other, bigger actions, but also of imagining other, bigger dreams. So in this sense, my message is a difficult one. It is that we will never arrive, that our struggles will never be over, our dreams never fully realized. But it is also a message not to be afraid of the space in between your acts and your dreams – it is a space of beauty, and of possibility, as wee as struggle. It is both the hardest, and the richest, space to occupy, and in which to work for change. This entry was posted in Guest Blogger, Uncategorized and tagged #Activism, #Africa, #AIDS, #eastman, #girls, #guestblog, #guestblogger, #hiv, #jenniferkyker, #music, #musicology, #research. Bookmark the permalink. I appreciate Dr. Kyker’s realistic compassion. Reading these thoughts gives us inspiration to keep working when the tasks seem too immense.